Frank Howarth got involved in an auction at his kids school again this year and made an incredible neighborhood art project. He started by cutting up a bunch of scraps and having he kids put them together to form pictures of their houses. Then he combined all the houses into a single neighborhood on a piece of wood. As I was out in the garage with Elijah a couple weekends ago, I thought he might like giving something like that a try. I cut up various pieces from some nice scraps and asked him to make a house. That proved to be a little challenging so we switched to robots. He was immediately on top of that and made two of them almost completely by himself. At that point we ran out of the scraps that I had cut and he ran out of patience so we called it quits. Later, I took a picture of what he had made and then transferred it onto a square piece of cherry plywood. 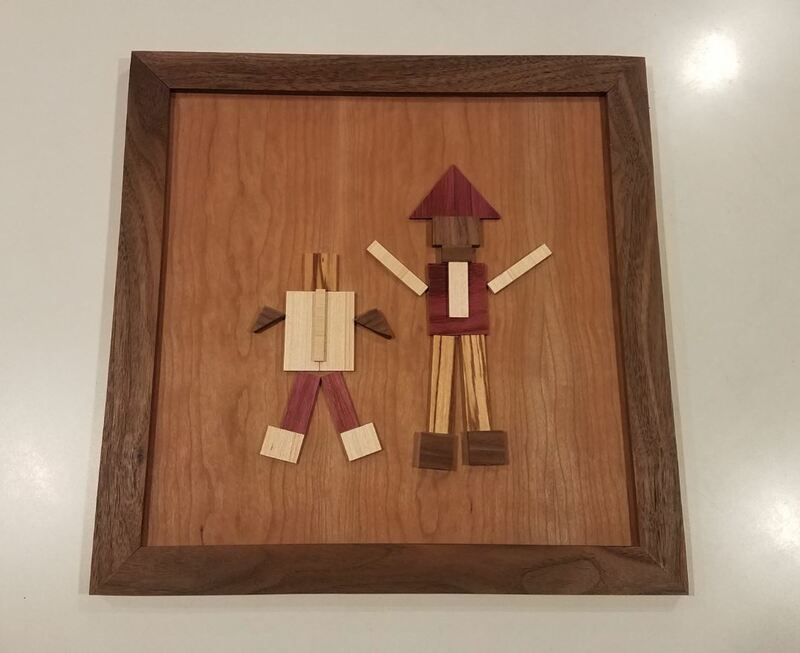 I made a simple frame out of some walnut scraps and voila! I’m excited to get this finished and hung on his wall. I’m waiting for the weather to warm up a bit so that I can put some finish on it.